Making a worthy comeback is one thing. Releasing a comeback album that is as good as your classic material is rare though. And yet, that is exactly what Kinniku Shojo Tai does on ‘Shinjin’. The band had broken up somewhat unceremoniously in the late nineties after a string of enjoyable, but highly inconsistent albums. A reunion was announced in late 2006 – without drummer Akira Ota but with original keyboard player Satoshi Mishiba helping out significantly as a session musician – and less than a year later, ‘Shinjin’ was released. Easily their best set of songs since their early nineties heyday, this is how comebacks should be. With Kinniku Shojo Tai’s trademark bizarre mix of punk, metal, funk rock, prog and Queen-like theatricality being firmly in place, it would be tempting to say that nothing has changed since the split. There is a small, but notable change of direction to be found, however, as post-reunion Kinniku Shojo Tai has a notably stronger orientation towards melodic hard rock and power metal than before. And while some may argue that wild genre-hopping was an important part of the band’s sound, it does cause the overall sound of ‘Shinjin’ to be a little more consistent than before. Of course, the band has not suddenly ditched all of its weirdness. There is some rather unique piano work underneath even the thickest guitar riffs and only very few western hard rock bands would dare to attempt a nervous, jangly sixties rocker like ‘Nukenin’. The fact that the first vocals on the album are some of the most aggressive “la-la-la” chants in music history (‘Nakanaori No Theme’) is quite telling as well. The campfire atmosphere of closer ‘Shinjin Band No Theme’ is one of the many moments evidencing the band’s sense of humor, but it’s surprisingly listenable as well. 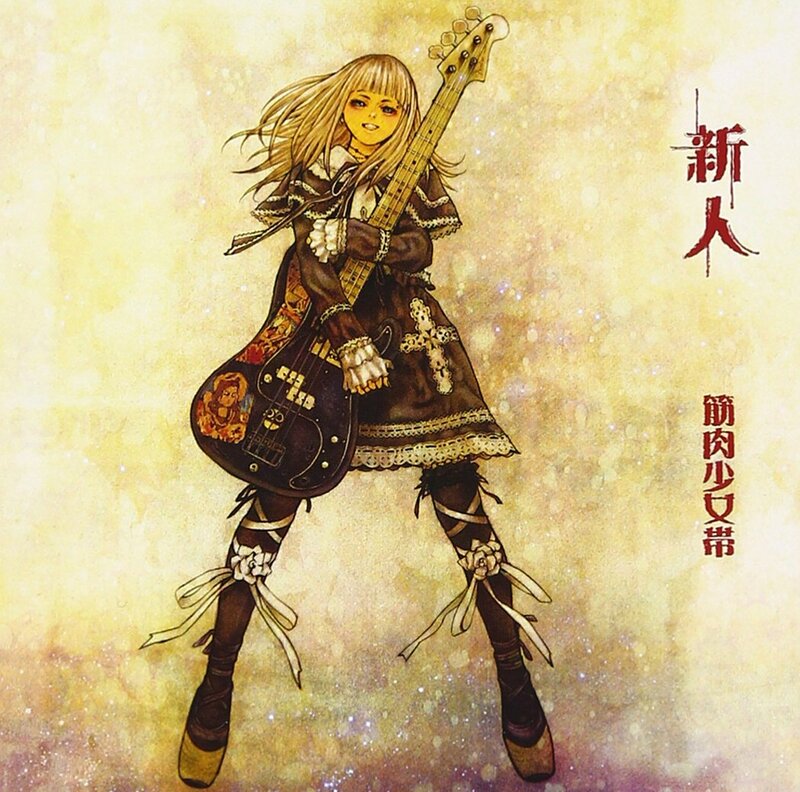 Still, if you primarily want to hear Kinniku Shojo Tai rock out, ‘Shinjin’ is one of the best places to start. The blunt force of the band’s punk roots shines through on ‘Mishiyo Hikikaiken’, but there’s a surprising amount of class in their hardrockers too. Fumihiko Kitsutaka’s compositions, such as ‘Torifido No Hi Ga Kitemo Futaridake Ha Iki Nuku’ and the particularly neoclassical ‘Headbang Hatsudensho’, are renowned for that, but the powerful ‘Ai Wo Uchikorose!’ appears to be from the same mold, despite being written by his fellow guitarist Toshiaki Honjo. Also, letting a singer as shouty and unsubtle as Kenji Otsuki sing no less than three ballads seems like a bad idea, but they are fortunately quite good, the remarkably dynamic ‘Koshonin To Rosalia’ in particular. Eclectic bands like Kinniku Shojo Tai usually have a couple of flaws on their albums, but they are quite limited in number on ‘Shinjin’. The sequencing could have been a little more effective and I am unsure about the necessity of the re-recordings of ‘Moretsu Ataro’ and the speed metal monster ‘Iwan No Baka’. Especially the latter does sound significantly better than the original version though. Having them on there does contribute to the album’s introductory value to the weird world of Kinniku Shojo Tai. ‘Shinjin’ is an album that plays to the band’s strengths, after all, and therefore worth a shot if you like any of the genres mentioned in this review. One of the most striking Japanese releases in 2018 was debut EP ‘The Seed’ by Narumi. This guitarist is mainly known for her work with power metal bands Destrose and Disqualia. However, on her instrumental solo debut, she displays a completely different side of herself. One that can still get heavy at times, but elements from film music and jazz fusion are at least as prominent. These types of records often end up being endless exercises of virtuosity, but Narumi keeps the melodies front and center in her surprisingly well-written songs. Her skills are impressive, but don’t get in the way of her songs. Plenty of reasons for a conversation with the guitarist. Interestingly, ‘The Seed’ is entirely the vision of just Narumi and her producer and arranger Issei Ambo. “I played all the guitar parts, everything else has been programmed by Issei Ambo“, she confirms. “This way, I was able to create freely, free from various restrictions, such as the intentions of a record label or finding a compromise between conflicting opinions of others. It was important for me to approach this solo project that way. I think it is interesting to see that the number of these kinds of independent artists is increasing worldwide. “The style in my previous activities was only a small part of who I am. And I am still evolving. My favorite musician is Sugizo, one of the guitarists in the famous Japanese rock band Luna Sea. But I also think guitarists like Plini and Steve Vai are great. There are so many that I cannot mention them all. ‘The Seed’ can be ordered through Narumi’s website. Just the EP costs 2000 yen and for 3200 yen, a bundle with the EP and a photo book can be ordered. The orders can be shipped internationally for only 200 yen. In terms of music releases, 2018 was one of the strangest years in recent history. Save for a few notable peaks – in June and September most notably – there have not really been extended periods with lots of great releases. In fact, some of the trusted names have released quite disappointing albums. Record companies seem to slowly shift their focus towards reissues and live releases, which is not necessarily a bad thing, but I would have been happy if there was some more previously unheard material that blew me away during the year. Nevertheless, there were two amazing albums this year that make an equal claim to the number one spot, both of them Japanese. In the end, I literally flipped a coin to decide the order of the first two records. Not unlike other recent years, many of the western artists in the lists are either relatively new bands that took me by considerable surprise or long-running bands that suddenly released a career highlight. That should be enough to still remain hopeful about the future of international heavy metal. Despite all of Onmyo-za’s albums being of excellent quality, nothing could have prepared me for ‘Hado Myoo’. 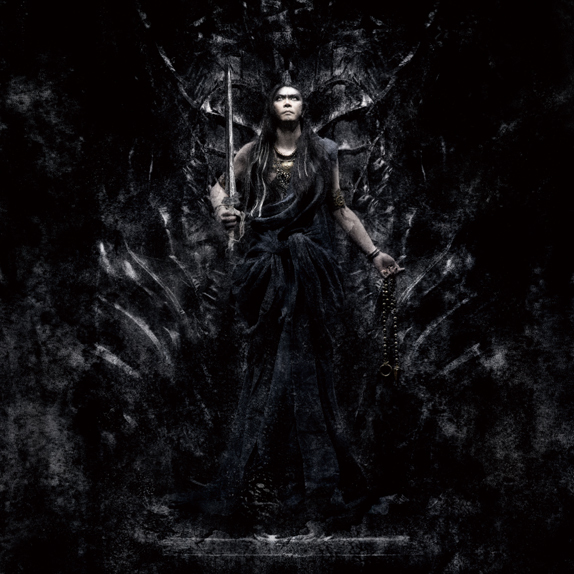 The album was darker and heavier than anyone could have expected – especially after the relatively lightweight single ‘Oka Ninpocho’ – but it still features the trademark melodic elegance that Onmyo-za is known for. During the album’s best moments, the contrast between Matatabi’s forceful sections and Kuroneko’s melancholic introspection really brings out the best of all sides of the band. 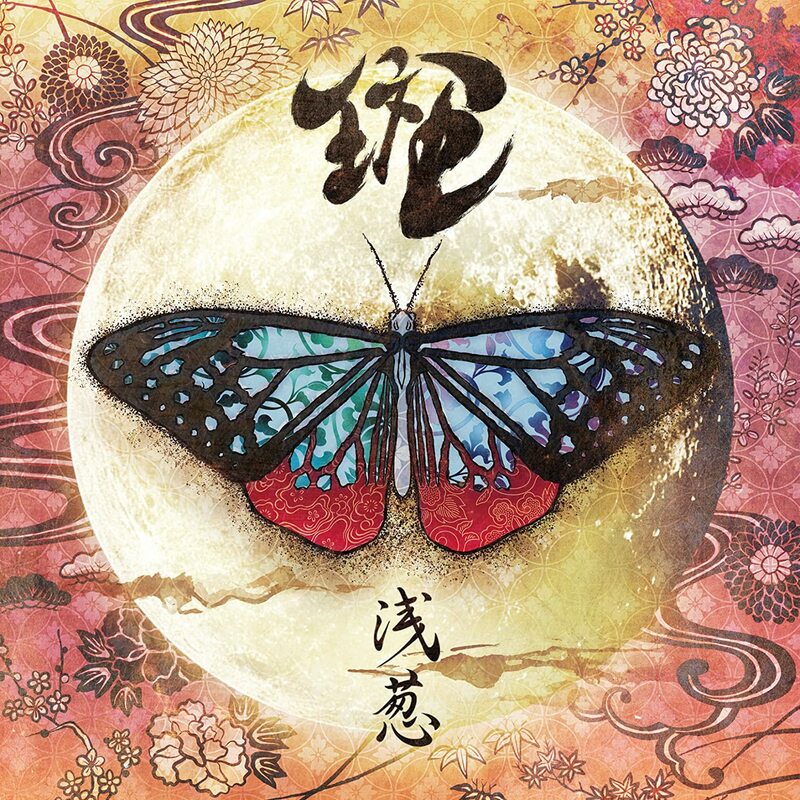 Onmyo-za is one of the very few contemporary metal bands that scores 10/10 on riffs, melodies, structure, memorability and vocals simultaneously and ‘Hado Myoo’ is one of the brightest examples of that. Since around 2011, Saber Tiger has truly been on a roll. Their current line-up is probably the strongest they have ever had and their song material is nothing short of excellence, combining the powerful melodies and overall feel of eighties heavy metal with the impressive intricacy of contemporary progressive metal. 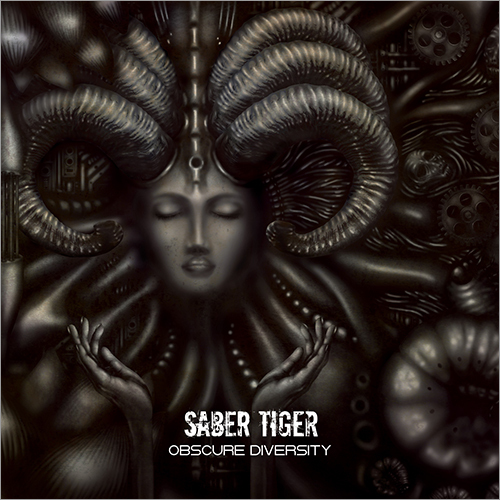 With these elements, Saber Tiger has crafted a sound that is completely unique and ‘Obscure Diversity’ expands on that by being more complex and more accessible at the same time. There’s a perfect balance between aggression, musical craftsmanship and memorability on the album. While many modern metal albums sound clinical and soulless, Saber Tiger retains the passion that is so important to the genre. Despite being familiar with Jake Dreyer through Iced Earth and White Wizzard, his own band Witherfall really blew me away from out of nowhere. ‘A Prelude To Sorrow’ was the most pleasant surprise of the year. Dark, but not self-pitying. Complex, but not impenetrable. Melodic, but not powerless. 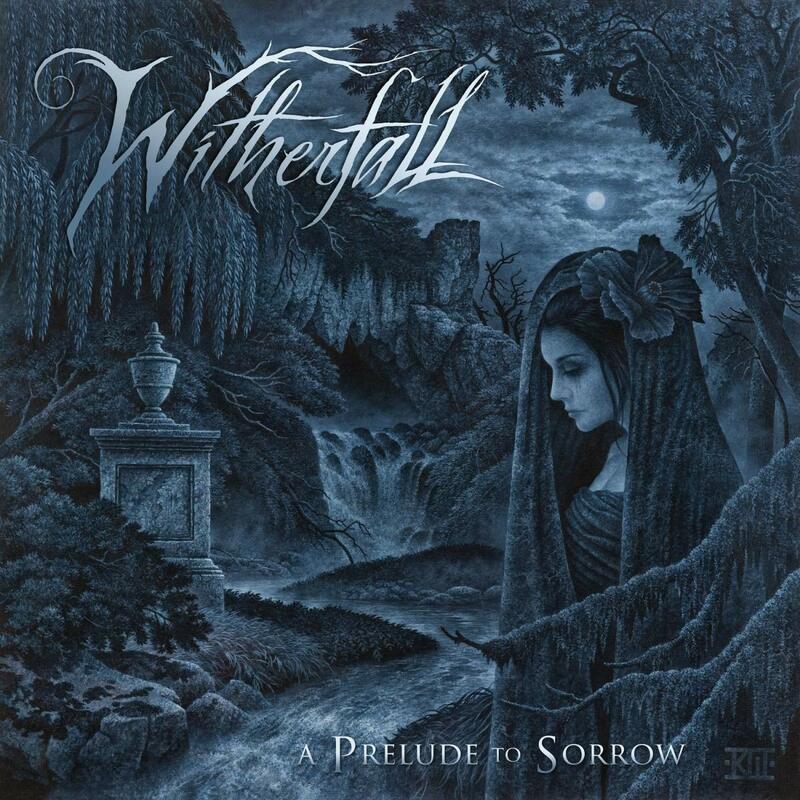 Witherfall does just about everything right here. Joseph Michael’s vocal performance is the cherry on the cake. He has the subtle rasp of a young Halford, the drama of Bruce Dickinson and a higher register eerily similar to Crimson Glory’s Midnight. There’s so much to this album that I can see myself listening to it for many years to come. In a way, Witherfall fills the void left after the definitive end of Nevermore with their expertly composed, dark progressive metal. Although The Black Crowes have always impressed me with their engaging combination of typically American music styles, the country influences got a little too prominent on their last few albums for my taste. 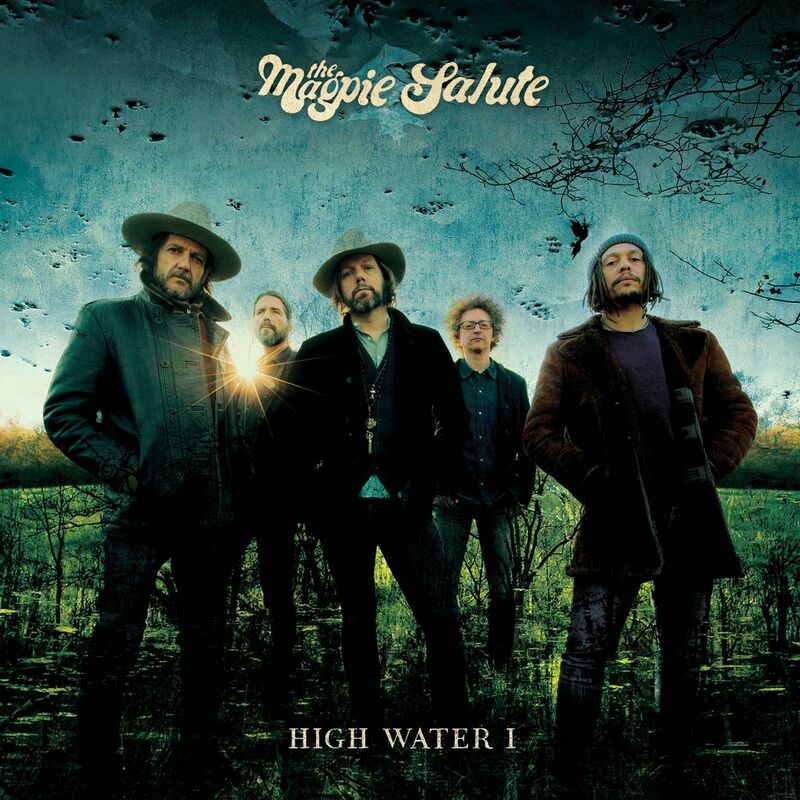 Apparently guitarist and main songwriter Rich Robinson also thought so, because while the rootsy sounds are still there on ‘High Water I’, the debut studio album of his new band The Magpie Salute, the songs are mainly rooted in bluesy hardrock, while the acoustic songs are more folky in nature. Singer John Hogg is a revelation. His passionate voice is what really lifts the album above the level of its already impressive songwriting. The melodies and atmospheres are captivating. At this point, I honestly hope the rise of The Magpie Salute will not be stopped by a Crowes reunion. Sure, Warrel Dane was in my top three favorite metal singers of all time, so it should not be too surprising that ‘Shadow Work’ is so good. But given the fact that he died during the recordings, it is remarkable how accomplished and well-arranged it sounds. It is essentially an unfinished record, but hardly does it ever sound like one. There’s a few moments where Warrel’s vocal lines are a little rough around the edges, but they give the album character rather than being distracting. The songs sound really good; they mainly display an even darker take on Nevermore’s formula. And one can hear that this has become a true labor of love for Dane’s Brazilian backing band. They play their hearts out below what is unfortunately Dane’s final farewell. It is a powerful one though! For years, the late Denis ‘Piggy’ D’Amour was deemed irreplacable. Martyr’s Daniel ‘Chewy’ Mongrain proved that nothing is impossible on the fantastic ‘Target Earth’ (2013) and now, ‘The Wake’ proves that was not just a fluke. The album steers slightly away from the technical thrash of ‘Killing Technology’ (1987) and more towards the futuristic, surprisingly relaxed progressive metal of ‘Nothingface’ (1989). ‘The Wake’ is an adventurous record that is likely to please any fan of mid-period Voivod, but is not simply copying the formula of those years. The songwriting on the album is simply too inventive and spontaneous for that. Many sections on the album even sound like improvised jams, which is highly unusual for a metal band. Then again, highly unusual is Voivod’s bread and butter! While D is easily one of the better bands in the visual kei scene, I was not too sure if a solo album of their frontman Asagi was what I was waiting for. It turns out that he took the elements from what I consider D’s best songs – the ones that are more Asian folk-oriented – and turned that into the style for his full album. On a majority of the album, traditional instruments like the shamisen, the koto and several percussion instruments are enhanced by the distorted guitars rather than the overused other way around, resulting in an album that may be even better than D’s already consistently great discography. In addition, it is admirable how Asagi managed to make ‘Madara’ sound like a uniformous album despite the numerous contributions of high profile guest musicians. ‘Gonka Za Slavoy’ is the single greatest song released last year. The rest of ‘Proklyatiye Morey’ is really good as well. In fact, ever since current (and best) singer Mikhail Zhitnyakov joined the band, Aria has been experiencing a bit of a rebirth. ‘Proklyatiye Morey’ is the third installment in a series of studio albums that is easily their best since their late eighties and early nineties heyday. In fact, ‘Proklyatiye Morey’ even finds the band branching out by treading their most progressive waters yet. Unlike some of the recent albums of their prime influence Iron Maiden, Aria manages to sound fresh and energetic throughout the album, however. The short, punchy songs are as good as the longer, proggy ones. If highly melodic old school heavy metal is your thing, ‘Proklyatiye Morey’ is an album you cannot afford to miss. Angra continues to release amazing records. And in true Angra fashion, ‘Ømni’ is different than anything they have ever done before. It is probably the album with the most pronounced Afro-Brazilian influences since their classic ‘Holy Land’ album. The best aspect about ‘Ømni’ is its versatility though. It is a progressive metal album with many different shades and faces. In fact, this is one of the few albums where I think “world metal” is a pretty good genre tag for it. Power metal is slightly less prominent than on ‘Secret Garden’ (2015), but that is hardly an issue here. Also, it is admirable how little of a difference the loss of long-time guitarist Kiko Loureiro makes. Marcelo Barbosa is an excellent replacement. I am fairly confident about Angra’s future at this point. ‘The Devil Put Dinosaurs Here’ (2013) made me fear that Alice In Chains had gotten too comfortable with its own sound, but fortunately, ‘Rainier Fog’ proved me wrong. Sure, the twisted anguish of ‘Dirt’ (1992) has gone, although traces of it can still be heard occasionally. 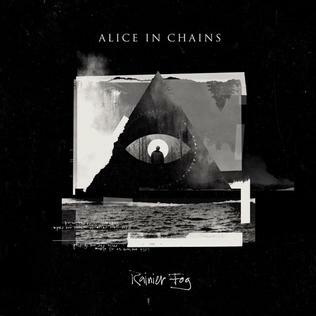 Naturally, the elements that make Alice In Chains the band people know and love are featured prominently on ‘Rainier Fog’. The dual lead vocal harmonies, the crushingly heavy riffs, the haunting minor key melodies and the melancholic ballads are all there. There is just a more spontaneous “let’s throw this against the wall and see if it sticks” vibe than before. Ultimately, what makes ‘Rainier Fog’ an above average Alice In Chains album is that the album contains some of the most memorable songs the Seattleites have written in a long time. Easily the greatest rock singer of his generation, the sound of Myles Kennedy’s solo album was surprising, to say the least. ‘Year Of The Tiger’ is an album rooted in acoustic guitars, but not in the pretentious singer-songwriter way of most rock singers. Instead, a large portion of the album has been written on resonator guitars, adding a sort of a country blues flavor to many of the songs. Of course, there is still the folky stuff such an acoustic approach tends to result in, but there is even some more powerful stuff here that would have been hardrock if the instrumentation had been different. The interaction between acoustic and electric instruments accounts for an album that is much more dynamic than one would expect. One of the surprise winners of 2018. Without wanting to sound too petty in my clean vocal fundamentalism, ‘Queen Of Time’ may have been higher on my list if it didn’t feature so much grunting from Tomi Joutsen. Musically, ‘Queen Of Time’ is probably the most interesting, layered album Amorphis has released so far. The songs aren’t radically different from what they did before, but the songs are significantly enhanced by the use of several traditional instruments, which gives the songs a depth beyond the quality we have come to expect from the Finns. Some of the choruses just beg for Joutsen’s excellent clean vocals and get his – admittedly good – grunts instead. If that does not bother you, you could do a lot worse than the equally progressive and melodic as heavy and brutal stuff on ‘Queen Of Time’. ‘Awakening From Abyss’ was one of the two albums in last year’s coin toss. ‘Clockwork Immortality’ did not impress me quite as much upon first spin. After some time, the album sunk in though. I still think it lacks something the debut did have, but there are too many good songs on the album to dismiss it easily. Overall, ‘Clockwork Immortality’ is slightly more streamlined than the previous Lovebites releases, but there is still an abundance of excellent guitar work by Midori and Miyako and singer Asami is still one of the best female rock singers in Japan. After some spins, my idea is that better sequencing could have improved ‘Clockwork Immortality’, but that doesn’t take away the fact that there are some excellent power metal and hardrock songs on the record. After the carefully arranged ‘Oscillation’, ‘Salvo’ finds Navarone aiming for the live energy that made them so good in the first place again. Stylistically, ‘Salvo’ combines some of the best rock music from the seventies and nineties, ending up sounding not too dissimilar to what Slash does with Myles Kennedy. Fresh, punchy songs with catchy choruses that don’t overstay their respective welcomes are all over ‘Salvo’. As always, the album proves that Navarone excels in writing smartly arranged rock songs that don’t sound like they have been labored over and the fantastic voice of Merijn van Haren ties it all together. Anyone who has once said that rock music is not what it used to be should certainly give ‘Salvo’ a spin. Unless you don’t like to be proven wrong of course. Another one of those albums I was not expecting to like so much. To me, White Wizzard was always one of those retro bands that rightfully had to settle for opening act status. Occasionally fun, but ultimately lacking in the songwriting department. ‘Infernal Overdrive’ prove me wrong. Gone are the days of blindly aping influences – though closing track ‘The Illusion’s Tears’ has its moments – and in its place, we have a bunch of excellent contemporary heavy metal songs with some delicious guitar work. Even singer Wyatt Anderson has improved significantly. Most of the longer songs feature a ton of engaging stuff as well. 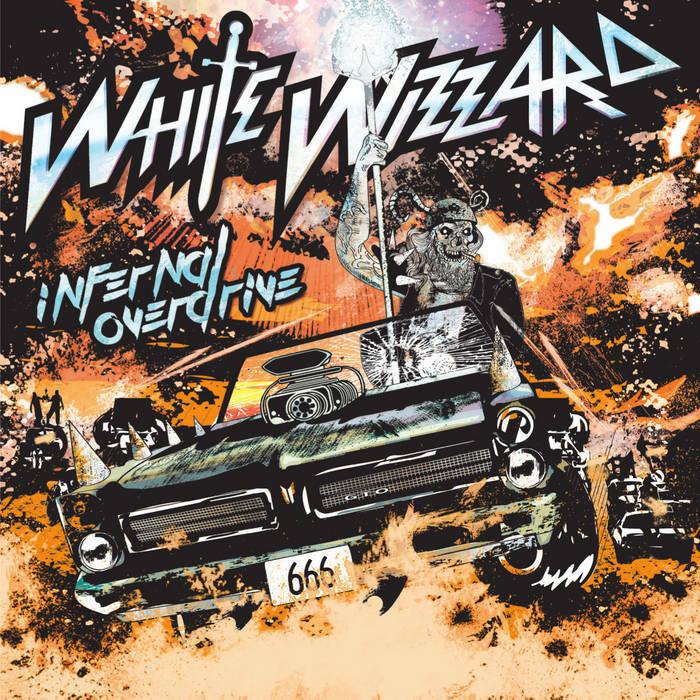 I had hoped for this to be the start of a bright future, but unfortunately, White Wizzard called it quits a few months after the album’s release. 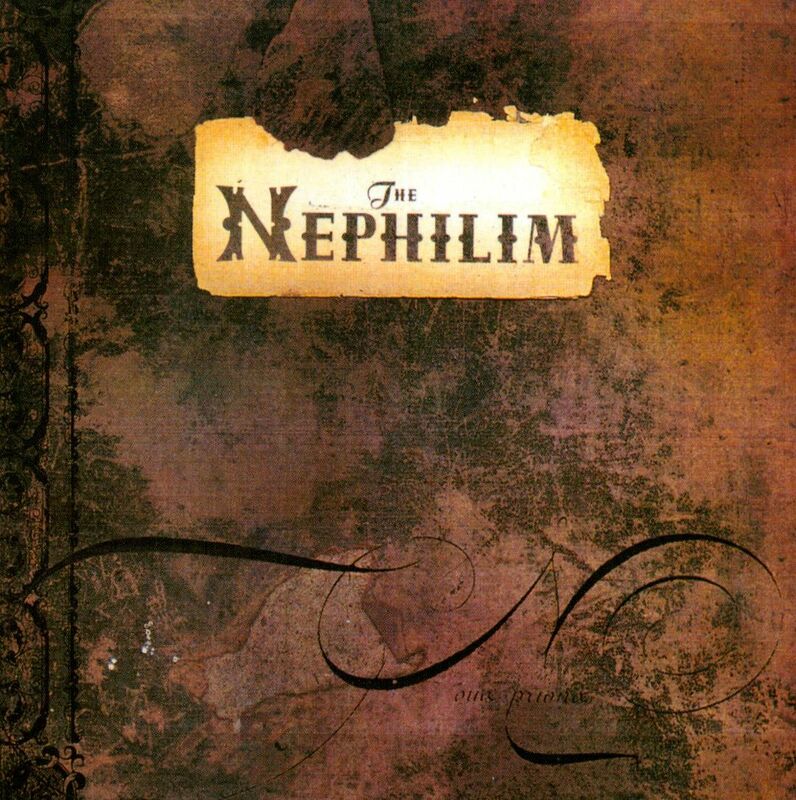 A significant portion of Fields Of The Nephilim’s fan base still considers their sophomore album ‘The Nephilim’ their best album. And while I personally prefer its follow-up ‘Elizium’, it is not hard to understand why. It certainly delivers on the promise that the band’s somewhat underdevloped debut album ‘Dawnrazor’ occasionally showed. Despite frequently being accused of merely copying The Sisters Of Mercy, their second album features Fields Of The Nephilim crafting its own sound that is indebted to gothic rock as much as it is to psychedelic rock and the soundtracks of the westerns they modelled their stage garb after. Despite the fact that it’s obviously the same musicians playing on them, the original three Fields Of The Nephilim albums each are a world of their own. ‘The Nephilim’ is significantly more refined and cenimatic in scope than ‘Dawnrazor’, but not as ethereal and melodic as ‘Elizium’. The derisive “gruff Andrew Eldritch” label that Carl McCoy often got is not entirely unjustified here, but though I prefer his cleaner approach on ‘Elizium’, it certainly fits the desperate, yet somehow defiant mood of ‘The Nephilim’. The production is ambitious, adding a layer of keyboards and samples in a way that doesn’t even feel like an added layer, but rather an integral part of the songs. In addition, the band had not yet shed its Morricone-isms on ‘The Nephilim’. And while it would be easy to incorporate those into the overall sound in a way that sounds like they were trying to be clever, Fields Of The Nephilim does it rather seamlessly, enhancing the atmosphere instead. Opening track ‘Endemoniada’ is easily the best example of this. More than half of the track is spent building towards the explosive, but brooding main section through low-key arpeggios and slide guitar bits that seem to suggest a solitary desert night. The dynamics of the song are nothing short of incredible. ‘Endemoniada’ is hardly the only highlight here, however. More concise tracks like the venom-filled ‘Chord Of Souls’ and the incredible ‘Moonchild’ would soon become live staples and the combination between McCoy’s intense vocals and Tony Pettitt’s equally melodic as atmospheric bass lines provide the basic structure for ‘Celebrate’ and the classic – though slightly overlong – ‘Last Exit For The Lost’. Elsewhere, Tony Wright and Peter Yates make the most out of the broad two guitar approach, often by mixing chiming arpeggiated chords and massive reverberating riffs, as evidenced by the dark, shimmering cinematics of ‘Love Under Will’ and ‘The Watchman’. With all the elements Fields Of the Nephilim employs here, it is hard to end up with an album that sounds pretentious or simply laughable, but somehow, it works. ‘The Nephilim’ cemented the band’s reputation as the new hopefuls for fans of the darker end of the rock spectrum in the late eighties. Even the less notable songs on ‘The Nephilim’ are very much worth hearing and work wonders for the dynamics of the album. It also finds the perfect middle ground between the raw aggression of ‘Dawnrazor’ and the psychedelia-infused ambition of ‘Elizium’. An excellent album by a band that would never be content doing what others have already done. Despite working with pretty much the same team as on its predecessor ‘Oscillation’, Navarone’s fourth album ‘Salvo’ is a completely different beast. Instead of releasing another carefully arranged production full of subtle intricacies that slowly reveal themselves over repeated spins, the quintet opts to focus on their live energy. Understandable, because that has certainly been one of the band’s biggest strengths throughout the last decade. The result is a record that may not have as many surprises as ‘Oscillation’ did, but with the set of powerful rock songs the band came up with this time, that should hardly be a problem. With ‘Salvo’ being the kind of “live in the studio” record that many seventies hardrock bands excelled at, Navarone is more focused stylistically as well. That does not mean that all the songs sound similar – giving every song its own character is a specialty of the band – but it does mean the majority of what you will hear consists of uncomplicated, riff-driven hardrock with strong choruses that are memorable without exception. There aren’t even any ballads. The dark, minimalistic southern blues of ‘Fire’ – one of the album’s most experimental tracks – is probably the thing that comes closest to one. Occasionally, ‘Salvo’ is reminiscent of the better work that Slash did with Myles Kennedy in recent years. Not just because Merijn van Haren en Kennedy are among the very few excellent rock singers of this era or because of the massive Gibson sound of Kees Lewiszong and Roman Huijbreghs, but also because of the fact that the songwriting has similar sensibilities. ‘The Strong Survive’ has that typical energetic feelgood vibe that the opener on a powerful rock record should have, while the grinding, moore moody ‘Waste’ is one of those deep cuts that could just develop into a classic over time. Navarone was never about blindly copying their influences though. ‘Another Way’ has a fairly unique approach in its combination of classic and contemporary rock styles, not to mention an awesome build towards its chorus. It’s the one song that would have made sense on ‘Oscillation’ as well. The fairly accessible ‘SøReal’ sounds like a nineties rock radio hit without directly sounding like any of the songs that actually were, while the crushing riff work of ‘Mind’s Eye’ is borderline metallic in nature. Sure, the Black Sabbath kind of metal and the overtones are more contemporary rock than anything esle, but that only contributes to the unique nature of that excellent track. Most amazing is the fact that Navarone brings all these elements together in a manner that does not sacrifice any of their catchy, recognizable songwriting. ‘Salvo’ has a very pleasant flow, likely more so than any of their other records. Many of the younger rock bands notably try to appeal either to old schoolers or the modern rock crowd. What Navarone proves once again on ‘Salvo’ is that it’s perfectly possible to have a multi-generational appeal if you just write and play the right songs. Highly recommended to anyone who mopes that all contemporary rock is inferior to the classic stuff. Despite being somewhat unpredictable stylistically, Kinniku Shojo Tai has been experiencing a very solid run recently. More so than during the latter years of their original run, in fact. Some of their recent albums are slightly better than others, ‘Omake No Ichinichi (Tatakai No Hibi)’ in particular, but none of them is less than enjoyable. ‘Za Shisa’ is another convincing entry into their discography, which currently counts over twenty studio albums. The general vibe is slightly more relaxed and less crazy than on their previous records, but anyone who liked their melting pot of influences before will certainly enjoy ‘Za Shisa’. Kinniku Shojo Tai’s unpredictability is a result of every band member bringing something different to the table. ‘Za Shisa’ features a relatively large amount of the playful funk rock riffs that guitarist Toshiaki Honjo specializes in. Everything muscular, classy and melodic is the work of Fumihiko Kitsutaka, who in my opinion is one of the world’s greatest guitarists and arrangers. Founding bassist Yuichiro Uchida usually is responsible for the weird progressive and psychedelic stuff, while his co-founder Kenji Otsuki yells, speaks and sings everything together. That sounds like it may not work, but ‘Za Shisa’ proves it does. The first peak of ‘Za Shisa’ arrives quite early. 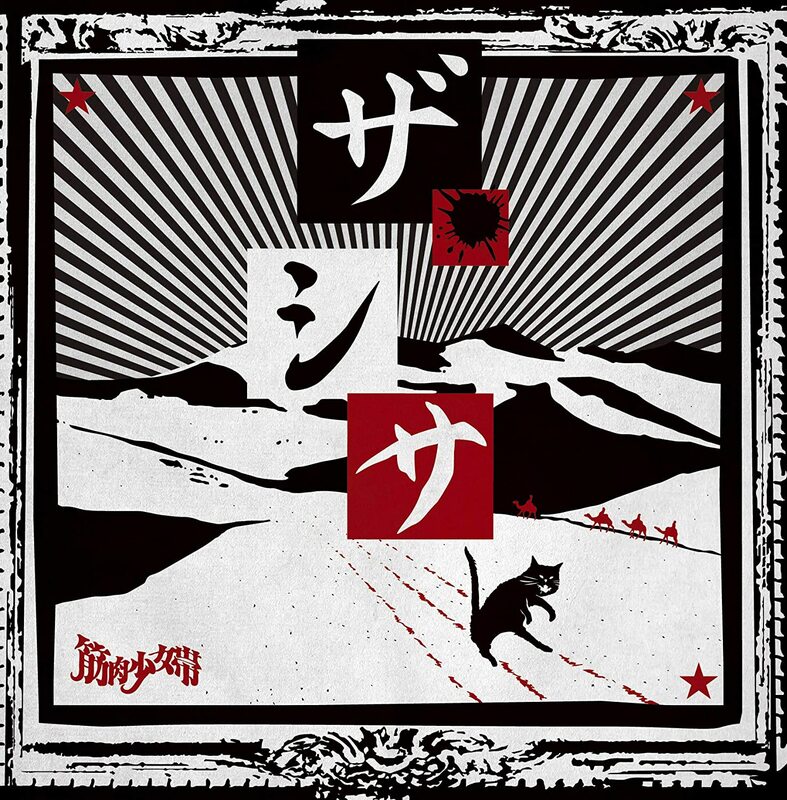 The elegant melodic hardrock of ‘Shogeki No Outsider Art’ is Kitsutaka in its purest form with a gorgeous chorus, after which the darker, vaguely Middle Eastern tones of the climactic ‘Occult’ account for one of the album’s most atmospheric moments. What follows is the most metallic track of the album; the aggressive speed metal of ‘Zombie River ~ Row Your Boat’ would not have sounded out of place on one of the band’s earliest releases. And like on those albums, the creative use of piano and dynamics lends gravitas to the energetic aggression. After that, the album takes a slight dip. Not that ‘Naze Hito Wo Koroshi Cha Ike Nai No Daro Ka?’ and ‘Uchu No Hosoku’ are bad songs, it’s just too much consecutive tranquillity. The pace is picked back up quite quickly though, with the subdued seventies rock feel with spoken verses of the awesome ‘Marilyn Monroe Returns’ bringing Thin Lizzy’s ‘Johnny The Fox Meets Jimmy The Weed’ to mind. Uchida’s songs ‘Kenji No Zundoku Fushi’ and ‘Parallax No Shisa’ have the dynamic, haunting quality he excels at. The former has a pleasant stomp, while the way the guitar line and piano melody teasingly dance in unison on the latter is only the beginning of its ominous atmosphere. ‘Next Generation’ and ‘I, Toya’ are pleasant upbeat rockers. Though ‘Za Shisa’ feels somewhat more laid-back, Kinniku Shojo Tai is still as weird and reluctant to stick to one genre as ever. As always, it may require some time to sink in, but it is a rewarding album for repeated spins. If you have not heard of the band before and need a western reference: imagine if Queen had embraced punk and further developed the metallic leanings of their first few albums. Now add a dash of Japanese weirdness to the mix. Sounds impossible? Tell that to them. They have been doing it for over thirty years. Curiosity about world music is natural for every rock band inspired by Led Zeppelin’s latter days. Very few make the leap of actually learning to play indigenous instruments beyond some rudimentary percussion though. This is exactly what The Tea Party did to further emphasize their – mainly – Indian and North African influences on ‘The Edges Of Twilight’. It takes the idea of incorporating these sounds further than just adding some melodies that vaguely sound like the western idea of Arabic or Indian music. And quite surprisingly, the Canadian trio manages to still sound like a powerful rock band while doing so. Ever the ambitious band, The Tea Party created a densely layered album, but in a way that can also be played with just three people. The arrangements on ‘The Edges Of Twilight’ are securely anchored within their trio line-up, after which bassist Stuart Chatwood and singer/guitarist Jeff Martin have added touches of traditional instruments. However, the world music is in Martin’s Gibsons almost as much as it is in the indigenous instruments through extensive use of twelve string guitars and Indian and Arabic minor scales. It all accounts for an immersive listening experience that is slightly dark, but never depressive. Since the band’s earliest shows, they have been accused of copying Led Zeppelin and borrowing a string phrase from ‘Kashmir’ in opening track ‘Fire In The Head’ probably wasn’t very beneficial to dispelling that criticism, but the fact is that there is much more to the song than that. Martin’s deep voice sets the somewhat seductive tone of the tune immediately and the riff work is extremely powerful. Even more powerful is the following ‘The Bazaar’, on which a monumental guitar riff is doubled by Chatwood’s harmonium. The song is relatively simple in construction, but still manages to move through several moods. Highlighting the album are undoubtedly the epics ‘Sister Awake’ and ‘Walk With Me’. The former starts out as a calm, folky tune, but quickly builds from an exciting percussive middle break to a monster of a dark rocker, while ‘Walk With Me’ manages to combine the gloomy atmosphere of most of the album with a begging, almost bluesy character. ‘Silence’ and ‘Drawing Down The Moon’ have a more traditional bluesy inclination, with the latter having a truly incredible climax. ‘Correspondences’ is a gorgeous, dynamic ballad, while ‘The Badger’, ‘Shadows On The Mountainside’ and ‘Inanna’ are calmer songs that draw on folk influences from all over the world. Ultimately, my only criticism of this album would be that ‘Turn The Lamp Down Low’ feels a little out of place on the record by being straight blues with added percussion, but the song itself is really good. As a whole, ‘The Edges Of Twilight’ is a very exciting album that takes a lot of interesting turns, despite their only being three guys. Martin and Chatwood should be happy that they can depend on a solid power hitter like Jeff Burrows, but it also helps that all the songs are extremely well-written. As for the accusations of being a Led Zeppelin copy: I’d say they took one idea Zep had and developed it further with spectacular results.